Male: swimmerets (“sw” above) on underside of “tail” (abdomen) each have one leaf-like segment; end of last (fifth) pair of walking legs similar to other walking legs and not claw-shaped (see below). 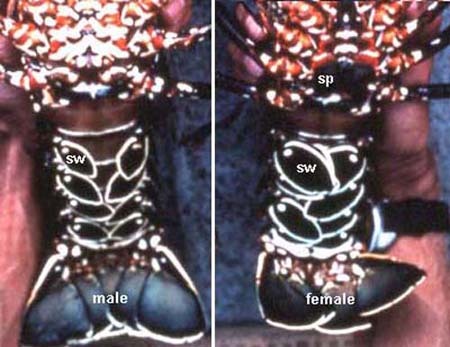 Female: swimmerets each have two branches – in first set both are leaf-like, others have one leaf-like and one rod-like branch; swimmerets usually larger than on males; spermatophore (“sp” above) may be present at base of last two pairs of walking legs; end of fifth pair of walking legs claw-shaped (see below). 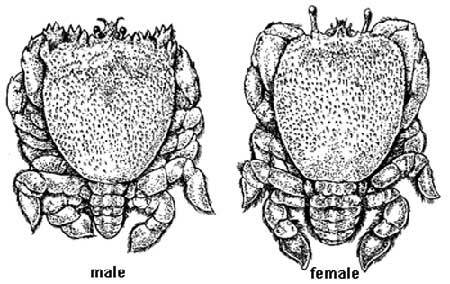 Male: “tail” (abdomen) narrow and pointed; front edge of carapace becomes squared with growth and develops horn-like extensions at the sides (see below). 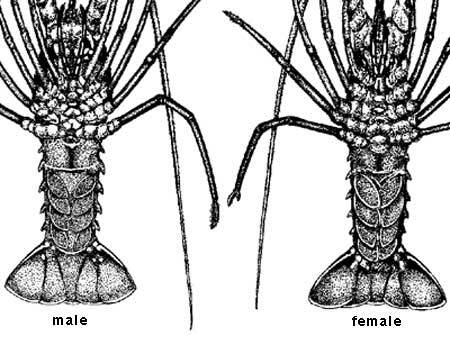 Female: abdomen broad and rounded, swimmerets under abdomen larger than in males and with numerous long bristles; front edge of carapace remains rounded and does not develop horn-like extensions. Male: “tail” (abdomen) is continuously tapered from its point of attachment to last segment. 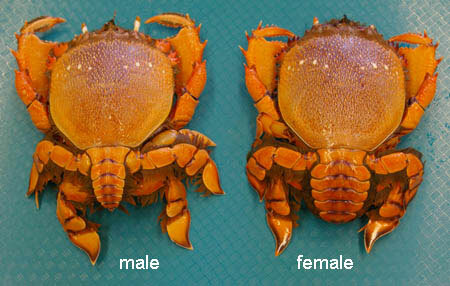 Female: abdomen is broad and rounded; first two segments about as wide as body.